TellApart is retargeting with ads, and you may not even realize it. Have you ever gone to a site looking for information, and then moved on to other kinds of sites, and then seem the same ads "following you" around on the web? That's retargeting, and it's TellApart's area of expertise. TellApart uses data it gleans from online retail traffic to predict whether someone who leaves a given website is still a likely customer of that site—or not. People deemed likely to return can be shown ads for the site whenever an opportunity arises on the real-time bidding exchanges used to fill online ad space. "We only get paid when we drive a sale," says Ayzenshtat. "We're confident that this works." 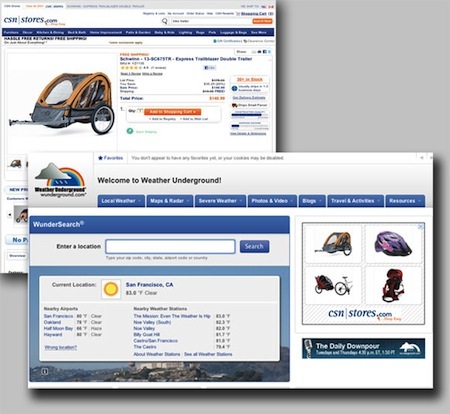 Ayzenshtat says the company's algorithms assess site visitors much as a salesperson would in a physical store. "When you walk in, the salesperson develops a profile based on what you're wearing, who you're with, if you have other shopping bags," says Ayzenshtat. "In the online world, the signals are harder to tease out." To do it, TellApart's servers sift through a tremendous amount of data provided by the online retailers it works with. At least ads from computer systems aren't following you around in the real world. Yet. The phone nearest him rang. Automatically, he picked it up. "Yeah?" Faint harmonics, tiny inaudible voices rattling across some orbital link, and then a sound like the wind. "Wintermute, Case. It's time we talk..." It was a chip voice. On his way back to the lobby... he had to walk the length of the ranked phones. Each rang in turn, but only once, as he passed.